If you like Denim and want a cool mug then you should check out this denim Miley Cyrus travel mug as it looks stunning and it is great as you everyday mug. The travel mug is made from double wall ceramic and the top has a press in suction lid so that you drink will be secure when you are on the go. On the white ceramic mug, you can see a black and white image of Miley Cyrus and she is wearing a really blue denim outfit and that makes the pants and jacket bring all the color this mug needs. If you like Miley Cyrus and are ready to go the beach then why not take this Miley Cyrus beach towel that shows that she is ready to perform. The towel shows a red background color and on that red, you can see Miley Cyrus sitting on a big Marshall speaker while holding a microphone with the wire so she is ready to sing for you. Miley is wearing a funky outfit that makes this towel even cooler. The Miley Cyrus beach towel is 37 x 74 inches but also comes in smaller sizes as a bath or hand towel. Now you can make anything festive with this Miley Cyrus Christmas sticker. 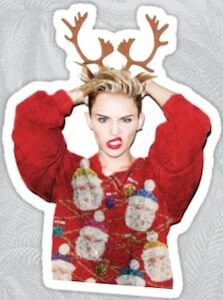 The die cut sticker shows Miley Cyrus wearing an ugly Christmas sweater and even having some reindeer antlers on her head. A vinyl sticker like this is great for making anything ready for Christmas and it can be removed without leaving glue marks so that you can just use the sticker to make something fun for Christmas. You can stick one on your laptop or maybe even your car and people will smile when they see Miley in her fun outfit while doing a weird thing with her lips. If you like Miley Cyrus and want an ugly Christmas sweater then this Miley Cyrus Christmas sweater could work out for you. The sweater is made for both men and women and comes in a bunch of different colors and sizes Small – 2XL. On the Christmas sweater, you can see Miley Cyrus and this time she is not sitting on a wrecking ball but on a red Christmas tree ball ornament. So Miley is all ready for the holidays and you can be too by simply wearing this ugly Christmas sweater and enjoy the party with Miley on your sweater. Now your iPhone can be ready for Christmas thanks to this Miley Cyrus Christmas iPhone case. 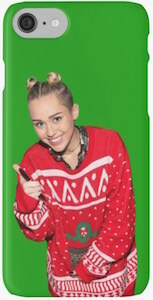 The iPhone case is green and on it, you can see Miley Cyrus wearing big red Christmas sweater and that makes this case just perfect for the holidays. So decorate your phone for the holidays and Miley will protect it from damage while it just looks perfect and festive. If you like Miley Cyrus then this is the backpack you want. The backpack is 12 x 5 x 15 inches and comes in black, orange, and white but that color is just for the sides and back as the backpack has a big photo on the front and that photo shows the face of Miley Cyrus while sticking her tongue out and holding her glasses. It’s funny to wear this backpack as people behind you will look at this funny face and I am sure that it will make them smile. A backpack as funny as this is great for school, work, and other adventures. Now there is a spiral notebook with Miley Cyrus on the front and that is perfect for school, work and at home. The notebook has a white front cover with on it a photo of Miley Cyrus and she is wearing a black crop top and torn jeans. As the cover beside the image is white Miley really seems to be focussing on you and that makes it extra special. Inside the spiral notebook, you will find 120 pages and you can pick between ruled or graph paper so that it is the notebook you need for your task. This ceramic Miley Cyrus mug is fun as most people will not see the famous star. Normally the mug is black but when you put a hot drink in it then it turns white and shows 4 photo’s of Miley Cyrus. Having a mug that morphs is always fun specially if it has Miley Cyrus on it. The ceramic mug offers room for 11 ounce of your favorite beverage but only when it gets warm from coffee, tea or any other hot liquid the image appears. Of course Miley Cyrus fans like you are going to love owning a special mug like this. This Miley Cyrus t-shirt is a bit different as normal as the short sleeves have a cool blue pool print and the neckline is blue to. Beside the water from the pool the t-shirt is white and on the front you can see a big picture of Miley with red lips giving you a wink. 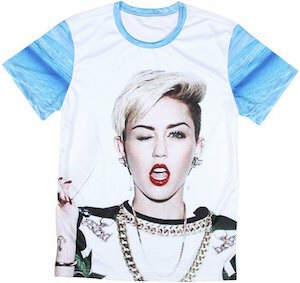 It’s a great looking Miley Cyrus t-shirt that work for both men and women. You can get this portrait t-shirt in unisex sizes Small – 4XL. 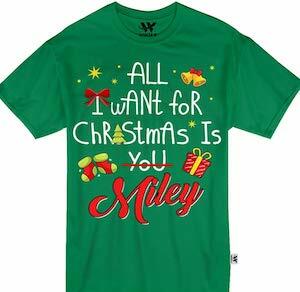 Wearing this Miley Cyrus t-shirt will make a statement and everyone will know that you are a true fan.